The four key processes of the employer-driven approach do not happen in a specific order, but they do occur continually and overlap across criminal justice systems through intake, pretrial, incarceration, and community supervision. They are facilitated by the stakeholder partnerships that provide services and resources both inside and outside prison walls. Use labor market information to identify high-growth occupations and target specific businesses. Address employer needs and expectations in marketing, placement, and job retention efforts. Prepare justice-involved individuals for employment, with an emphasis on soft-skills and industry-standard training and certifications that will meet employers’ expectations for qualified applicants. Engage and partner with stakeholders who can help provide critical resources and support services. Corrections professionals have several critical missions with one overriding goal: to ensure that inmates who leave supervision do not reoffend and do not return to prison. Research confirms that employment is important to successful reentry, so training and job placement programs are essential to connecting inmates to the labor market upon their release. While many of these programs exist, few are driven by an intentional partnership with the business/employer community. The most successful employment programs are ones that are employer-driven; they are built on labor market information that targets employers who are hiring, industry-standard training and certifications that meet employers’ expectations, and placement that focuses on benefits to employers. How are the Model and Toolkit used? The Employer-Driven Employment Model and Toolkit provide practitioners with a blueprint and resources needed to build an effective employer-driven job training and placement program for justice-involved individuals. 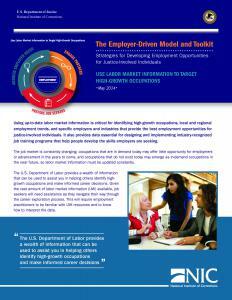 They also outline the steps needed to ensure that employment programs meet current and future labor market demands. Brief descriptions of replicable, effective practices. Key questions and answers to employment readiness and job placement concerns. Links to resources and contacts that provide access to various strategies for supporting employer- driven job preparation, placement, and retention. Applying the toolkit concepts and strategies will take different shapes according to local needs and opportunities. The intent is for you to adapt these concepts in ways that work for your own facilities and individual programs. How is the Toolkit implemented? Relationships are the central theme of the toolkit. While there are many examples of strong relationships between corrections agencies and business, the fact remains that employers are not lining up outside of correctional facilities waiting to hire men and women leaving supervision. Corrections agencies and individual facilities and programs must reach out to employers. Navigate corrections and business environments. Demonstrate the value of hiring justice-involved individuals. Describe the training, skills, and screening that inmates gain while incarcerated. Be able to listen to employers describe their needs so that the best possible match can be made between inmates and job openings. Lastly, specialists must be able to develop relationships with employers that are strong enough to overcome the inevitable challenges that will occur along the path toward successful attachment to the labor market. Relationships represented in the model will take time and energy to initiate and effort to maintain over the long term. To establish an employer-driven job placement model, facilities, programs, and systems will need to make an investment in human capital. Collective experience in the corrections field informs us that only with this investment will efforts at increasing employment, reducing recidivism, and improving public safety succeed.